Today, as we celebrate Mothers around the world, I would like to share a story often told by our late Mother – Corporal Audry Rutherford Stafford, RCAF Women’s Division WWII. It’s the story of one of the most exciting days of her life – when she performed at the halftime show at Grey Cup 1943. Mother grew up in Edmonton during the Great Depression. When she turned sixteen and decided to find a part-time job, her father Charles Rutherford warned her that in those dark days of the ‘dirty thirties’ even men couldn’t find jobs, and that she would likely ‘wear out her shoe-leather‘ long before anyone would hire her. Determined to find work, she took a street-car to the Eaton’s store in downtown Edmonton, walked in, boldly approached one of the clerks, and asked how she might find a position at the store. The clerk answered – ” wear a crisp,white blouse, and a navy skirt, and come early in the morning, when the store opens, and ask to speak with the hiring manager”. The advice worked and she got a job as a sales clerk. In 1939 the Second World War broke out in Europe. As the next few years passed there were an increasing number of recruiting posters across the country, as more soldiers were required for the war efforts overseas. Her brother Jack went to sign up, but because of his poor eyesight was rejected. Hearing this, she grabbed her hat, headed down to the recruiting office, and signed up that day. “Someone needs to represent the family in the war efforts“, she said. After completing her basic training at the Rockliffe Air Base in Ottawa, and another round of training at St. Thomas, she was posted to the No.8 Bombing and Gunnery School in Lethbridge, Alberta. It was while she was posted there she met a dashing young soldier by the name of ‘Tib’ Stafford, a charming lad from Drummond Township, Lanark County. Photo: Tobias ‘Tib’ Stafford and Audry Rutherford when they first began their courtship, downtown Lethbridge, Alberta 1943. Corporal Audry Rutherford RCAF WD, on a visit home to her parent’s place, in Edmonton in 1943. 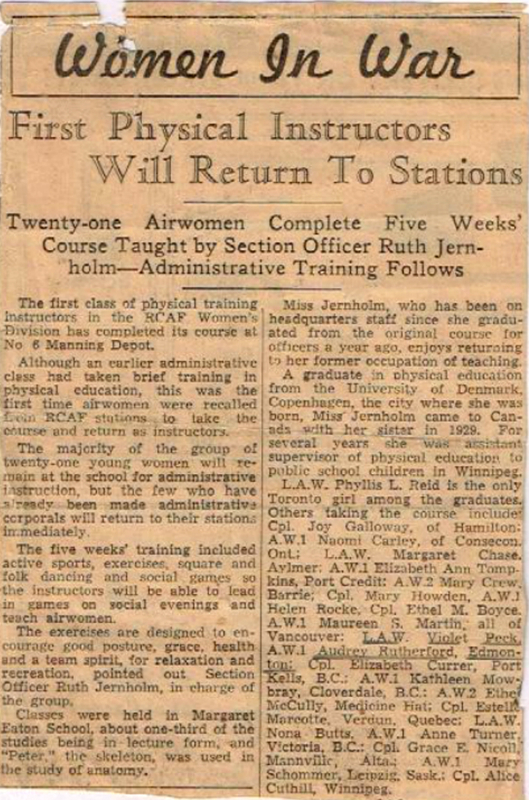 For the first time in Canadian history, a select group of airwomen were sent from their air bases to train as Physical Education Instructors. Twenty-one women in total were selected for this prestigious program, sent for a five-week training program, and were immersed in various active sports, exercises, developing team spirit, studying general health practices, and recreation. Classes were held at the Margaret Eaton School in Toronto, and while many of the classes were conducted in lecture form, ‘Peter’, the skeleton, was used in the study of anatomy. Section Officer Ruth Jernholm was in charge of the group. Miss Jernholm was a graduate in physical education from the University of Denmark, Copenhagen. She had come to Canada with her sister in 1929 and began her career teaching children in the Winnipeg public school system. A highlight for these girls in the program was an invitation to perform at the half-time show at the 1943 Grey Cup game held on November 27th in Toronto. It was a day not to be forgotten, and a story told and re-told by our late Mother. And so, today, as each of us remembers our own Mothers, let us also take a moment to remember the women who have served, and continue to serve their countries proudly, in times of peace and war. 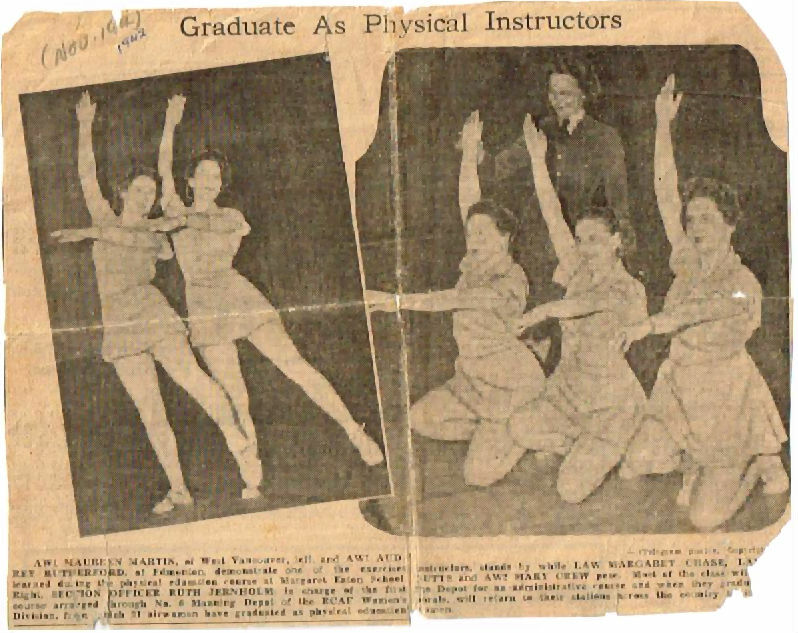 This entry was posted in Historical Interest and tagged Airforce Physical Education WWII, Alice Cuthill, Anne Turner, Arlene Stafford-Wilson, Audry Rutherford, dorothy woolsey, dorothy woolsey rutherford, eaton's department store edmonton alberta, Elizabeth Ann Tompkins, Elizabeth Currer, Estelle Marcotte, Ethel McCully, Grace Nicoll, grey cup 1943, jasper ave edmonton 1930s, Joy Galloway, Kathleen Mowbray, lethbridge alberta 1940s, lethbridge alberta air base 1943, Margaret Chase, Mary Crew, Mary Howden Helen Rocke Ethel Boyce, Mary Schommer, Maureen Martin, Naomi Carley, Nona Butts, Phyllis L Reid, RCAF Women's Division, Ruth Jernholm, Violet Peck, Women's Airforce.